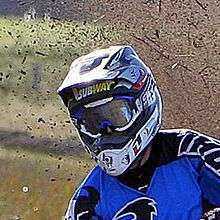 A helmet is a form of protective gear worn to protect the head from injuries. 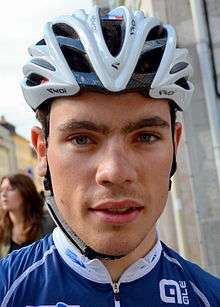 More specifically, a helmet aids the skull in protecting the human brain. 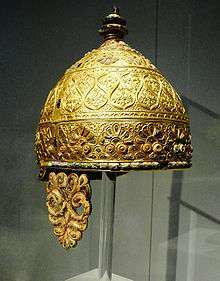 Ceremonial or symbolic helmets (e.g. UK policeman's helmet) without protective function are sometimes used. 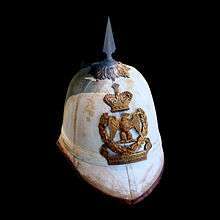 The oldest known use of helmets was by Assyrian soldiers in 900 BC, who wore thick leather or bronze helmets to protect the head from blunt object and sword blows and arrow strikes in combat. 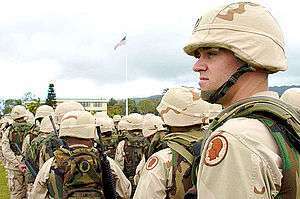 Soldiers still wear helmets, now often made from lightweight plastic materials. 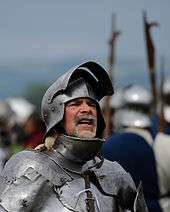 The word helmet is diminutive from helm, a medieval word for protective combat headgear. 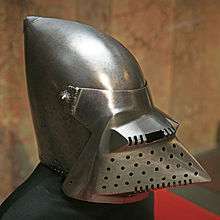 The Medieval great helm covers the whole head and often is accompanied with camail protecting throat and neck as well. 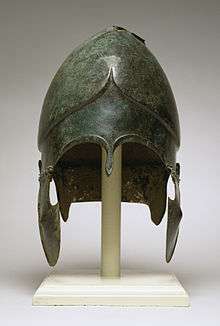 Originally a helmet was a helm which covered the head only partly. 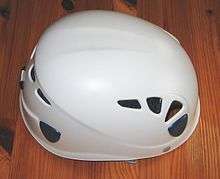 All helmets attempt to protect the user's head by absorbing mechanical energy and protecting against penetration. Their structure and protective capacity are altered in high-energy impacts. Beside their energy-absorption capability, their volume and weight are also important issues, since higher volume and weight increase the injury risk for the user's head and neck. 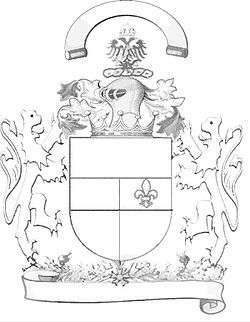 Anatomical helmets adapted to the inner head structure were invented by neurosurgeons at the end of the 20th century. Historically, helmets have been made from a wide range of materials, including various metals, plastics, leather, and even some fibrous materials such as Kevlar. 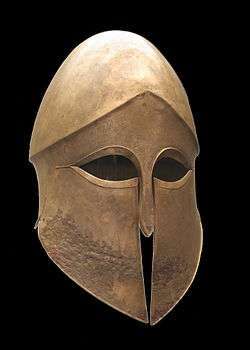 Ancient and medieval helmets were usually made of metals, often bronze, iron or steel, though some boar's tusk helmets were known to ancient Mycenea. Military applications in the 19th-20th centuries saw a number of leather helmets, particularly among aviation and tanker crews in the early 20th century. 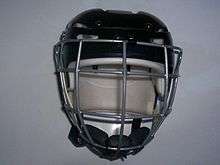 In the early days of the automobile, some motorists also adopted this style of headgear, and early football helmets were also made of leather. In World War II, American, Soviet, German, Italian and French flight crews wore leather helmets, the German pilots disguising theirs under a beret before disposing of both and switching to cloth caps. The era of the First and Second World Wars also saw a resurgence of metal military helmets, most notably the Brodie helmet and the Stahlhelm. Ottoman zischagge helmet, mid-16th century.